The small rural school of St John's at Silkwood prides itself on being both Christ and child centred, providing excellent learning opportunities for the students it serves. 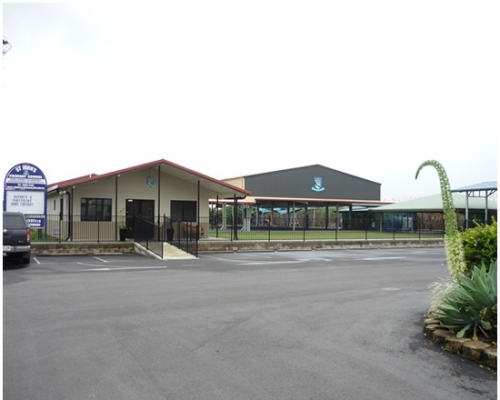 The school is located in the heart of the Southern Deanery on the Cassowary Coast. Geographically placed in between the larger towns of Mission Beach, Tully and Innisfail, the school draws many of its students not only from Silkwood, but also the surrounding communities of Kurrimine Beach, Mission Beach and El Arish. St John's proud history commenced in 1948 when the school was opened by the Missionary Franciscan Sisters. The school comprised of children from the Silkwood area who were mainly of Italian descent and whose parents worked in the sugar cane industry. The Sisters served the local community for forty years, leaving in 1987. Today the dedicated lay staff continues the proud tradition of quality Catholic Education to many of the children and grandchildren of those first students. The current St John's community is respectful of the past and excited about the future, as it plays its part in inspiring St John's students to live the school motto of "Always Reaching For New Heights." St John's is proud to offer several distinctive curriculum features to existing and prospective parents and indeed the wider Silkwood community. St John's is proud to be able to deliver €œone stop learning" for students from Prep through to Year Six. Our stand alone Kindergarten facility presently caters for 3-5 year olds three days a week (Tuesday, Thursday and Friday). Many of our current P-6 students first met at St John's Silkwood Community Kindergarten. This service is affiliated with Catholic Early Learning and Care (Diocese of Cairns) and offers a program designed for children aged three and a half years and older. The program aims to enhance a child's physical, emotional, intellectual, spiritual, creative and social development. The curriculum taught at St John's School encompasses all of the Australian Curriculum Learning Areas, with an emphasis placed on Religious Education, English, Science, Hass, The Arts and Technology. Programs are created with the understanding that children develop and learn differently and with an awareness of multiple intelligence's and different learning styles. St John's offers a number of specialist programs. €œSocial and Emotional Learning" is developed through the €œSecond Steps" program to help foster better social and emotional intelligence. A music tuition program caters for the musically talented students and provides an additional opportunity for performance at special assemblies that feature our musicians. Physical Education is provided by a specialist teacher. The school is also very well resourced in Information and Communications Technology (ICT). In addition to classroom computers, the school has a one-to-one technology device policy which means students has their won device - chromebook, iPad, mini iPads. The integration of iPads, chromebooks and other ICT's enhance our teaching and learning outcomes across the curriculum. St John's is committed to a variety of assessment and reporting procedures that demonstrate student achievement and success at their respective level of development. Student Portfolios and parent / teacher conferences are completed in both first and second semester which provide a formal opportunity for students, parents and the classroom teacher to celebrate aspects of each students' learning journey and set goals for the following semester or year. St John's also produce a school based student report card at the completion of both semester one and two which provides parents with a detailed account of a student's overall achievement across all aspects of school life. Excursions and camps are part of the curriculum at St John's. School camp for the Year 5/6 students has provided an opportunity for students to examine content descriptors of the Australian Curriculum in an adventurous and unique way. Students in Prep- 6 are expected to participate in any excursions that has been organised. Students in Yr4/5/6 are expected to participate in any excursion that is organised. The St John's Justice Squad is made up of school leaders in the senior class. Regular meetings include an agenda, minute taking and decision making processes. All students from P-6 participate in the Premier's Reading Challenge. Students are asked to read 15-20 books over a period of three months and receive a certificate from Premier. Water confidence classes for P-6 students are held in Term Three. The objective of this program is to raise student's water awareness and safety. Soccer is without question the most popular pursuit of both male and female students, many of whom are members of the Silkwood Soccer Club and Peninsula Representative teams. St John's has an active association with the Silkwood, Mena Creek Sports Association which provides inter-school and representative sporting opportunities for our students. The construction of an 800 square metre undercover sports facility enhances outdoor learning opportunities in all weather conditions for our students. The library and classrooms provides a state of the art learning facility to promote contemporary and digital education. Our extensive sporting fields are complimented by two synthetic run ups for our long jump pits and a full size 400m athletics track. St John's has had a long association with Mrs Tina Patane who visits St John's to take a large number of our students for private Speech and Drama lessons. Additionally, Mrs Patane instructs and conducts the whole school in preparation of Choral Verse speaking. Each year the students participate in the Innisfail Young Performers Eisteddfod, with much success. A music tuition program provides small group music instruction with a qualified music tutor. At St John's, the unique gifts and talents of all students are valued. Within and beyond the school, every effort is made to find new and innovative ways to celebrate these. St John's School is a true reflection of the friendly and community minded Parish and town in which it is located. People who are new to the school (children, families and staff) are always welcomed openly. The work ethic and tireless commitment of the families of St John's maintains an optimistic and committed view towards the future for their children. The school prides itself on an incredibly hard working and effective Parents and Friends Association. The Parents and Friends are involved in coordinating the school tuckshop, uniform shop, social events, working bees as well as being the major source of raising revenue for the school. St John's School recognises and respects that parents are the first educators and as such, are important stake holders in optimising the educational outcomes of their children. The ongoing partnership between the school and parents occurs formally four times a year (Assessment and Reporting) and informally daily, weekly and each term. Parent information evenings, year and term overviews, assemblies, newsletters, excursions, sports coaching, sacramental programmes are all ways staff and parents work together for the benefit of students. The small school enrolment (42 families) creates a family atmosphere at St John's. Another benefit of a small school is the capacity for everyone to become involved in the social and family orientated events held each year. Through the sample of parents surveyed, 93.9% of parents agreed that St John's School (Silkwood) lives out the Catholic values of witness and service in their words and actions. 97% of parents agreed that St John's promotes justice, compassion and service and this high percentage of parents respect the leadership team at St John's. 100% of parents agreed that they would recommend St John's to others. Also, 97% of parents agreed that St John's provides high quality services to parents and students. 97% of parents stated that the school encourages each child to achieve to the best of their ability. Also, our parent satisfaction survey stated the 97% of parents throught classrooms were well presented and stimulating places for learning whilst also having beautiful spacious grounds. The final comments from our survey showed that parents have the upmost confidence in the future direction of the school and provide the best learning opportunities to their students by being well equipped with excellent teaching and learning resources. NAPLAN - Principles of Good Writing. The majority of staff at St John's agreed that the school lives out Catholic values in their words and actions, promoting justice, compassion and service. Our staff strongly agrees that St John's delivers quality educational outcomes for students, encouraging students to develop a love of learning. The majority of staff believe that they are provided with the training and professional development needed to do job well. Staff are very supportive of each other and enjoy a great working relationship with their colleagues. At St John's parents are requested to make contact with the school via telephone or email on the day that the student is absent. Unexplained absences are followed up with a telephone call from the school. If patterns of non-attendance occur, the principal will request a meeting. These procedures are outlined in the parent handbook as well as published in the school newsletter. At St John's we use the principles of visible learning and teaching. Teachers recognise learning through the eyes of the students and see themselves as learners. Evidence is used to create innovation in the learning environment. The characteristics of a good learner are promoted in all aspects of school life. These include the following: articulating what they are learning and why, understanding assessment tools and what their results mean, positively supporting their peer's learning, setting goals and actively seeking feedback. We recognise the need to teach thinking strategies which encourage higher order thinking skills placing a high priority on empowering students with thinking skills such as: the ability to reason, to make informed judgments, to critically evaluate information, thinking creatively, the Numeracy Coaching Program resulting in enhanced teaching and learning at St John's. Significant time and money has been invested into professional development, purchasing and organisation of resources. St John's School staff is committed to achieving excellence in teaching and learning. Alignment between the Mission and Vision statements has the enhanced effect of providing a safe, supportive and challenging learning environment for the students. A school wide focus on our vision "plant the seed, nurture the growth and celebrate the harvest", promotes student growth. The staff at St John's is working to ensure that we have a collaborative approach to teaching, learning and assessment that is explicit and promotes visible learning. Leadership and staff have implemented a Professional Learning Community to develop a continuous cycle of inquire to collect information to improve teaching and learning practices which will lead to improved student outcomes. St John's ambition is for students to develop a lifelong engagement with learning. St John's has established high standards for our students and responds to individual needs through differentiated programming. 100% of students are proud to be a student of St John's. The majority of students agreed that Religion is an important part of school life and they are encouraged to develop personal faith. Students believe St John's is a great school. All students agreed that the school rules are fair and consistent. They agree that the school is well organised and runs smoothly (81%). Students feel comfortable in participating in class activities (90.5%) and that students are encouraged to do the best they can (100%). The students also agreed that learning is important to them. From the same sample, 90.5% students said that learning was interesting and challenging and makes them think.